The boys have been playing with Mega Bloks since a very young age. The boxes of mixed blocks are perfect for little hands and can be played with from 1 year onwards. They are large enough not to get lost or swallowed but fit together nicely for all those towers they love to make and knock down again. Up until recently I was not aware they did a range for older children, this was until I was sent some through to review. First up I was sent the Rescue Centre which is part of the Blok Town Range. 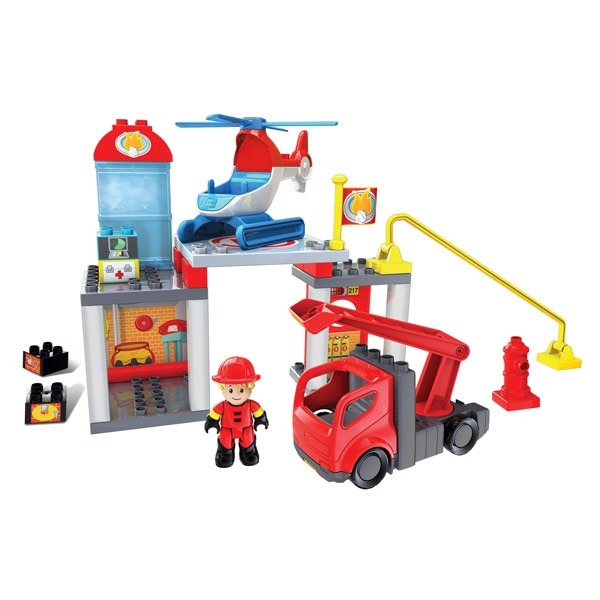 The Blok Town range has playsets like a farm, zoo, garage, dump truck, etc. These are a stage on from the the individual blocks, allowing the child more imagination and a purpose for which they are building. The Rescue centre is aimed at ages 3+ which is around the right age for my youngest Tyler. He is very clever when it comes to building and was able to build this himself, he isn’t 3 yet. He absolutely loved it and has asked for more of the Blok Town sets for his Christmas. I love the fact that the sets work on their own or can be combined with the others for more fun and imagination building. Tyler had so much fun playing fireman, sliding the fireman down the pole and into the fire engine when the fire alarm is raised. There is a hose, hydrant and ladder to help the fireman put out any fire he may encounter. Let’s not forget the helicopter which went flying across the living room to save a cat from the tree. I have to say, this is a great buy. Excellent value for money, well built, great use of imagination and is played with again and again. I have bought more of this set for Tyler’s Christmas. The second Megabloks toy we reviewed was Papa Smurfs House. This range is aimed at 4 +. Perfect for my oldest Lucas who is coming up for 5. He still plays with the blocks but I feel he is growing out of them a little, he needs something he has a bit more control over. Something more intricate but not too difficult or fiddly and this is where this range fits in. After having seen the film The Smurfs Lucas was excited when he received this playset. He got all the bits out and built it up, it didn’t quite look like the picture but the house was in the right place. There were quite a few wee fiddly bits which kept going under the couch but I am guessing that’s what happens when they get older and the toys get smaller. I did find that this wasn’t as sturdy as the other Megabloks sets we have. The house didn’t fit together as well as I thought, but it was still a fun toy and is well played with. 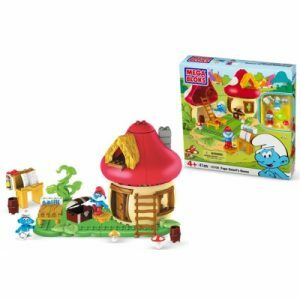 Inside the little mushroom shaped house is an area where the smurfs can play and do spells with Papa Smurfs spellbook which also comes with the set. There are some tables and chairs where they can have some dinner or a spot of lunch. Let’s not forget there isn’t just Papa Smurf for your little one to play with, there is also another Smurf, happy Lucas called him. I think he’s getting mixed up with Snow White and the Seven Dwarfs but I could be wrong. All in all this was a fun little set which Lucas enjoyed playing with. I do think it could have been made out of better plastic that would allow it to fit together better, but he still enjoyed it and goes back to play with it. It’s not expensive and you can add other playsets to go with it which I think makes it good value for money. I’m not sure I will be buying another of the Smurfs playsets due to the flimsiness but it won’t stop my buying some of their other sets they have to offer, including the Power Rangers ones which I know Lucas will love. Have a look yourself at the other ranges they do on their website. Disclaimer:- I was sent two sets in exchange for my honest opinion.